Imagine there are two guys in your ward, both active in the church and stalwart in the faith. One is a vegetarian who prefers to eat mostly organic food, fresh and in season. He drinks herbal teas, and almost never eats meat. By "almost never", I mean he's not stupid; he'd eat an animal if he ever found himself in a situation where he was starving. But he tries to eat healthy, and he has one guilty pleasure no one in his ward knows about: At the end of a long day, he likes to kick back with a cold beer. The second guy loves food - all kinds of food. Especially meat. For him, a day without meat would be a day without sunshine. Junk food is a way of life with this guy. He could take or leave fruits and vegetables, and he mostly leaves them. He wouldn't think of drinking herbal teas, because "hot drinks are not for the body" (except hot chocolate). He doesn't smoke, drink, or dance the hoochi-coo. And he looks like Jabba the Hut. So here's the question: Which one of these two guys would you say most perfectly lives the Word of Wisdom? But, you ask, what about that daily beer? I said most perfectly. Because, along with his other positive habits, he drinks beer, he's the one most perfectly living the Word of Wisdom. God tells us in Section 89 that beer is one of the reasons He gave us barley. If you didn't know that, it's probably because like many latter day saints, you learned all about the Word of Wisdom in Sunday school, but you've most likely never gotten around to really reading the thing. So let's look at it again. Remember the part describing the purposes of the various grains, the one that begins "Nevertheless, wheat for man..."? Open your scriptures to Doctrine and Covenants Section 89 and turn to verse 17. Let's read, in God's own words, what he created barley for: "...and barley for all useful animals and for mild drinks, as also other grain." The early saints would have been astounded that future members would ever conflate their mild barley drink -beer- with the "strong drink" advised against in verses 5 and 7. Early Mormons regularly consumed beer without compunction, as had most of mankind throughout recorded history. In 1843 the church's newspaper, the Nauvoo Neighbor, advertised ale and beer available at the Nauvoo Brewery. Joseph Smith oversaw a fully stocked bar located at his home in the Mansion House. In an 1844 journal entry Joseph Smith mentions that he stopped in and "drank a glass of beer at Moesser's". He mentions this in passing as if it was no big deal, because to him it wasn't. This was eleven years after Joseph received the revelation known as the Word of Wisdom, so you can't say he didn't know better. The fact is, beer was not proscribed by Section 89; it was prescribed. Within three years of the saints' arrival in the Salt Lake Valley, breweries were operating at the mouths of every river canyon from Logan to Nephi. Most of the saints were immigrants from England, Denmark, and Germany, and these Teutonics brought with them their old-world brewing skills. A sizable brewery once sat close to where the Provo temple is now, and the Henry Wagener Brewery took up a massive 150 acres just across the street from where the "This Is The Place" monument now stands. So many breweries appeared so fast that by 1851 the smell emanating from all these operations provoked the city council to declare them a nuisance. Yet they continued to operate. Beer was manufactured and consumed by faithful members of the church who never gave a second thought to the idea that there might be anything wrong with it. Most would have applied Benjamin Franklin's famous declaration regarding wine to their beer and ale, that it was "proof that God loves us and loves to see us happy". By the time Johnston's Army arrived in 1857, ushering in a steady stream of thirsty gentiles through Utah, things really took off for the Mormon brewers. Beer was available everywhere, including the church owned ZCMI where both Mormons and gentiles could stop in to grab a brewski any day but Sunday. So how did the LDS church membership devolve from an appreciation of beer as a gift from God, to our present-day anathema toward it? Well, we got the idea from the protestants. By the time of the Manifesto in 1890, the LDS conversion rate was practically nil. All anybody knew about Mormons were that they were that crazy bunch of polygamous weirdos off in the desert. Any growth the church experienced was primarily internal, as pretty much the only baptisms Utahns were performing were on eight year old kids who already lived there. Certainly nobody new wanted to join. The united states government and the eastern newspapers had painted us such pariahs that we couldn't get anybody to take our religion seriously on a bet. Missionaries couldn't get anyone to take a pamphlet, let alone read the Book of Mormon. Proselyting was at a standstill. We needed to find some way to get our numbers up. Meanwhile back in the states, a huge temperance movement was sweeping the sectarian religious world, a backlash against decades of unbridled American alcoholism and public drunkenness. Public vows of abstinence were all the rage. It was no longer cool to profess Christ on Sunday if you spent Saturday night in a saloon; now a man's spiritual measure was taken by how vociferously he denounced the demon rum. The motto of virtuous young women everywhere was "lips that touch liquor shall never touch mine", and young men, whose lips desperately wanted to touch the lips of young women, dutifully fell into line. It was futile to argue with these women that beer and ale, which were brewed, did not belong in the same class as hard liquors such as whiskey, which was distilled. These young ladies had zero tolerance for any of it, it was all the same to them. Talk to the hand, 'cause the lips ain't listenin'. There was a pious war against booze raging in Christian America, and mild drinks were getting caught in the crossfire. The debate spilled over into Utah where, though public drunkenness was strictly forbidden, wine and distilled spirits had always been available (some members paid their tithing in wine they made themselves; the St George tithing office reported collecting 7000 gallons by 1887). Still, hard liquor was hardly tolerated by Mormons the way beer had traditionally been. "...All general authorities were not in agreement on all aspects of the word of wisdom...After he became president of the church, Lorenzo Snow again emphasized the centrality of not eating meat...and in 1901 John Henry Smith and Brigham Young, Jr., of the Twelve both thought that the church ought not interdict beer, at least not Danish beer." Apostle Anthon H. Lund, who happened to be Danish, agreed, especially with the part about Danish beer. So did did Mathias F.Cowley and others. 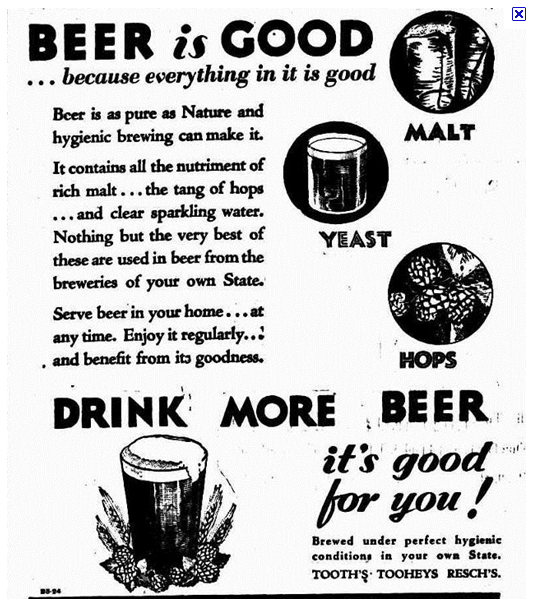 Over the next couple of decades, the Mormon people as a whole jumped on the Temperance bandwagon, and in 1919 Utah enthusiastically ratified the 18th amendment prohibiting all alcoholic beverages, including beer. Utah breweries closed down and before long all traces disappeared. In time, the descendants of the pioneers forgot they had ever existed. Land once occupied by the sprawling Henry Wagoner Company eventually became home to the Hogle zoo. The Mormon support of prohibition had a positive effect on missionary work. We could boast to teetotaling Christians that we were way ahead of the curve on the evils of alcohol, having been hip to that scene as far back as 1833. With the hub-bub over polygamy having pretty much quieted down, the church was experiencing a re-branding. Missionaries were no longer fearsome devils come to steal your daughters; they were now those nice young men who didn't smoke or drink. Looks like we'd found our gimmick. After America came to its senses and repealed prohibition in 1933, many Christians no longer saw any harm in the occasional beer, but by this time Mormons were so proudly tethered to their image as the fermentedly free that they couldn't let go. It allowed us to remain a peculiar people, but now in a good way. Our image as strict non-drinkers was what was now defining us to the rest of the world. It was the thing that was getting us in the papers. And within the church the Word of Wisdom gradually transmogrified from a gentle principle with promise to That Doctrine Which Must Be Obeyed. Anyone who actually reads the Word of Wisdom is struck by the dichotomy between what is declared in its opening verses and the way it's promulgated by the church today. The actual revelation is very clear in its wording that what is to follow is "not by way of commandment or constraint". It's a guide to healthy living, a principle with a promise attached for any who choose to follow the wise advice therein. A modern member might hear about the Word of Wisdom all his life and never know of the counsel it gives regarding food -what should be eaten and what should not. The emphasis today is always on the four negatives we are to avoid: alcohol, coffee, tea, and tobacco (and sometimes Pepsi, according to some). A person can think he's living the Word of Wisdom to the letter without ever having read it, and actually be in egregious violation of it, like Brother Jabba above. So, who changed the Word of Wisdom? How and when did the Lord declare unquestioning obedience to be so paramount that almost all other doctrines and practices take a back seat? In Seminary I was told that some years after the saints arrived in the Salt Lake Valley, Brigham Young announced that the saints had now had plenty of time to quit using tobacco, liquor, tea, and coffee, and that henceforth the Lord had declared they were to live it as a commandment. But is this true? Did Brigham Young ever make such a declaration? More importantly, did Jesus Christ, author of the revelation, tell Brigham Young that it was no longer voluntary? "September 9th, 1851, President Brigham Young stated that the members of the church Had had sufficient time to be taught the import of this revelation, and that henceforth it was to be considered a divine commandment. This was first put before the male members and then before the women, and by unanimous vote accepted." "President Young rose to put the motion and called on all the sisters who will leave off the use of tea, coffee, etc., to manifest it by raising the right hand; seconded and carried. "And then put the following motion; calling on all the boys who were under ninety years of age who would covenant to leave off the use of tobacco, Whiskey, and all things mentioned in the Word of Wisdom to manifest it in like manner, which was carried unanimously." As Robert J. McCue makes clear in his analysis "Did The Word of Wisdom Become a Commandment in 1851? ", the vote was simply a personal commitment by those present to abstain from items condemned in the Word of Wisdom. It wasn't until nine years later that Brigham Young himself gave up tobacco, although he had long considered the habit uncouth, filthy, and offensive. In 1860, nearly a decade after he was supposed to have declared the Word of Wisdom a commandment, he advised the Brethren, "If you must use tobacco, put a small portion in your mouth when no person sees you, and be careful that no one sees you chew it. I do not charge you with sin." "I will not call upon you to make a covenant to do this, for some might break their covenants, and that would be a sin." Brigham Young made many statements condemning the use of hard liquor and tobacco, but never claimed a commandment from the Lord on the subject. Indeed, Thomas G. Alexander affirms that there never has been a revelation from the Lord requiring obedience to the Word of Wisdom, or converting it from voluntary to mandatory. This is not to say that these substances are not harmful; there's no question that they are. But God only commands us regarding our interactions with others. He does not interfere with our free agency to make our own mistakes regarding how we treat ourselves. always trusted. This author is read by religiously hard-core vegans and food purists who strive at putting only pure raw foods into their bodies and avoiding all harmful substances in their search for both physical and spiritual perfection. He told his readers that most of them were neglecting an essential nutrient that God had provided for thousands of years: Beer. More particularly, fermented hops, an essential ingredient in beer. According to this expert, for at least the past four thousand years, mankind drank beer at the end of the day to relax, and there's a reason: God meant for it to be that way. God gives our bodies the means to accomplish what's necessary throughout the day. Our bodies create stress so that we can get things done. Stress is what enables us to get up, go, and keep going. But at the end of the day the body needs to let go of all that stress, otherwise the nervous system remains to some degree highstrung; it never truly unwinds. The pollinated hops flower contains anodynes and soporifics that relax the nerves in a way nothing else can, and a beer made of fermented barley is the best way to deliver those hops to the nerves that need them. The small amount of alcohol in a pint of beer assists in that delivery. And this is key: one beer is all it takes; more than a pint or two is too much. 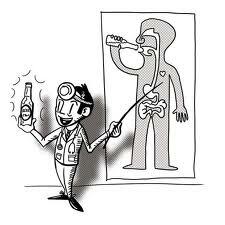 An excess amount of beer can be detrimental to the liver and other parts of the body. That's why Section 89 calls for moderation. It may not even be necessary to have a beer every day. For some people a pint at the end of the week does the trick. The point is to reverse the stress buildup and relax your nervous system. 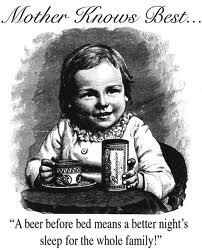 Beer has antibiotic properties, it helps you sleep, and the barley contains important B vitamins and other nutrients. Those who stress all day and do not provide their bodies with the means to undo all that stress before bedtime are asking for trouble. Are there other ways besides beer to cope with the stresses of life? I suppose. Antidepressant drugs are prescribed in Utah more often than in any other state, and at twice the national average. I would guess one reason is because, unlike the rest of the world, we refuse to recognize and use a natural substance God gave us to cope with stress, even when our own scriptures provide for it. If we are to believe the statistics, Mormon women are the country's unhappiest creatures. Wouldn't it make more sense if, instead of ingesting a dangerous drug twice a day, you simply followed the counsel of the Lord and sipped at a bottle of beer while reading to the kids? You could help them learn what the Word of Wisdom really says, while at the same time affirming to them Ben Franklin's adage regarding the proof of God's love. Or are you more comfortable rejecting the counsel of God in favor of obeying the doctrines of men? 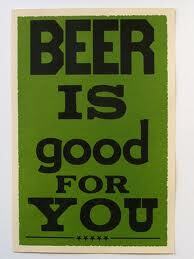 Even though I now know it's good for me, I confess to not drinking any beer myself yet. The thing is, I tried beer some forty years ago and couldn't stand the taste. I just don't understand what anybody sees in it. It's horrible. I'd sooner drink my own urine. But I've decided I ought to give it another try, though this time with a quality brew. The problem is, I haven't the slightest idea how to go about selecting a good beer. I know nothing about it. I'm the squarest square in Squares-ville. Actually, it's not so much quality I'm looking for as something that would just taste acceptable to me as a first time beer drinker. 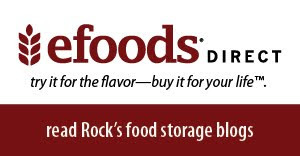 I sure don't want to buy a twelve-pack of something with a fancy label just to find out it tastes like crap. I don't know how to tell one brand from another. I went to Smart & Final to read the ingredients on labels, but guess what? Beer labels don't tell you what's in the beer. I suppose it's assumed that all beer has the same ingredients, but since I wasn't sure, I didn't buy any. I did see that some labels say they're made with wheat, but I don't know if that means wheat only, or wheat in addition to barley and hops. Would wheat and barley and hops taste better than simply barley and hops? And how would I know which is which? What I think I'm looking for is a traditional brew made with hops and barley, so I can have the kind of beer Joseph Smith himself would have drank. But I want it to taste decent, so I'm open to suggestions. I know that some of the readers of this blog are Jack-Mormons (excuse me, "less actives") who may have discovered the joys of beer already, so I'm counting on you to help me out with this so that I can finally, truly start living the Word of Wisdom. 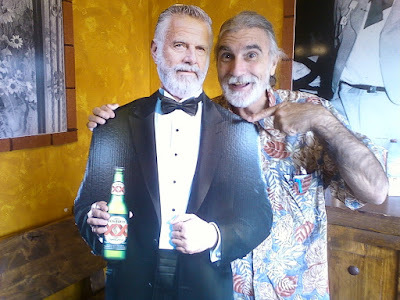 The Most Interesting Man in the World gets his picture taken with the Dos Equis guy.